If computer monitors can shrink to almost nothing, why not keyboards? They soon may. Two companies have developed prototype "virtual" keyboards designed to accompany portable devices like PDAs, tablet PCs and cell phones. Here's how they work: a laser beam projects a glowing red outline of a keyboard on a desk or other flat surface. A sensor like those used in digital cameras monitors the reflection of an infrared light projected on the same spot. It can tell which "keys" you are trying to strike by the way that reflection changes. 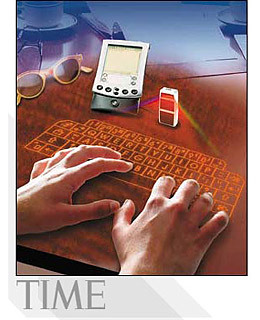 Someday, similar keyboards may be built into the gadgets they work with, so that they disappear when not in use.